On visiting a national park in summer fall or spring, you will get access to unlimited trails and magnificent campsites in the pleasant weather. On the contrary, the story of a winter visit of a national park is completely different – fewer crowds and stunning snow-capped mountains. It is the perfect time to visit national parks. You might find the access and operations limited but we have managed to bring you this list of national parks that are even better in winter, regardless of the limited operations a access facility. Keep reading. Located in the Southern Oregon, the Crater Lake National park receives almost 44 feet snow every winter and as such the campgrounds and rails are all buried under the white snow. This doesn’t mean that you can’t plan a trip during winters. The road to Rim Village and Highway 62 are open throughout the year and easily accessible. However, the first snow of the year covers the Rim Drives turning into a perfect snowshoeing and cross-country skiing route. For beginners, the west rim is a good option and the east rim can be trailed by the experts with training to handle the avalanche zones. This effort of trailing across the snow will bring you spectacular views of the placid lakes from the Garfield-Applegate and Sun Notch Ridge. You can also enjoy the snowshoe hikes on weekends starting from December to April. You won’t be able to find accommodation inside the park in winters – stay at Union Creek Resort, 20 miles from the park. One of the best national parks to visit in winter in the U.S. is the Rocky Mountain National Park in Colorado. The backcountry skiers visit the park in large numbers during the snowy winters into the steep couloirs and high-elevation peaks. You can take the classic route of Colorado, the vertical 1500ft Dragontail Couloir. Colorado Mountain School provides guided excursions of backcountry skiing inside the park and hostel-type bunks at Estes Park charging a minimum price of $40 per night. You can also book the Ridgeline Hotel in the town at a price of $119 per night. So, you have booked business class flights days back for the conference in Colorado? 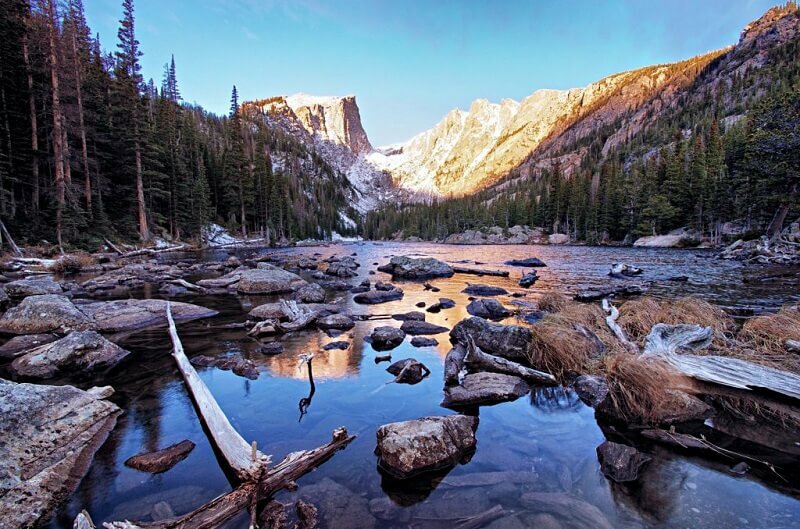 It’s a great opportunity to visit the Rocky Mountain National Park. Just extend your trip for a day or two. This year take the non-profit wildlife winter tour through Yellowstone by the one and only Wildlife Expeditions of Teton Science Schools. It is indeed hard to beat as you travel in a Mercedes-Benz snow coach through the roads covered with snow. It is a van having four tank treads in place of tires. You just can’t stop alluring the views of the majestic Old faithful and other geothermal features in the park. Book a room in the Old Faithful Snow Lodge situated inside the park boundaries. It can only be accessed through the snow coach shuttle at this time of the year. However, it is worthy experience in exchange of your $160. Among the various national parks in California, Yosemite National park is one of the best visits during winter. Situated on the southern area of Yosemite National Park is the Yosemite Ski and Snowboard Area having 25 miles of well-groomed trails for the cross-country skiers and around 5 chairlifts and 90 acres of snow area for downhill skiers. You can enjoy ice-skating absorbing the scenic view of Half Dome at the outer rink of the Yosemite Valley or go for the 21mile round trip of cross country skiing to experience a breathtaking panorama of the valley. You can book the Ostrander Hut that needs one to take the 10-mile ski trip. Let’s now ta about the best national park in Utah in winter – Bryce Canyon National Park. Fantasize the brilliant stargazing, empty trails and snow covering the vast red-rock desert – that’s the Bryce Canyon in winters. There’s even a winter festival organized in the national park from February 16 to February 18, 2019. You can book your last minute flights to Utah right away, if you don’t want to miss the event. The event includes guided fat biking, cross-country ski tours, ranger-led full moon snowshoe tour and some photography clinics. It is once in a lifetime opportunity indeed and you have still got some time to make it possible. Book Ruby’s Inn as it is the closest accommodation from the park entrance starting at $80. Another important national park visit in winters is at the Acadia National park in Maine. It will be a perfectly scenic drive through the Park Loop Road. AS soon as you are in the park, get into your snowshoes or you can also enjoy skiing on the snow-covered pathways all across the national park. If you are a cross-country enthusiast, it is great opportunity to go on a 32-mile trail for snowshoeing and skiing (cross-country) by the popular Friends of Acadia Winter Trails Association. You can book the Acadia Hotel towards the downtown Bar Harbor with rooms starting at $99 per night. 5 Best Galentine’s Day Trips in the US to Enjoy With Your Girl Gang!